*Multiple artists available for large-scale events. Approximately 12-15 small designs can be completed in one hour. Approximately 6-8 medium sized designs can be completed in one hour. Please contact me to discuss an ideal amount of time for an artist to come by for an event. Weekend dates (especially in the summer) tend to fill very quickly. It is best to book at least 3 weeks to 1 month (possibly longer) in advance for summer weekend dates. Weekend dates in the early spring/late fall/winter can be booked 1-2 weeks in advance. However, some dates remain vacant even in the height of summer. Days during the week (any time of year) tend to not be as busy. Please contact me to check availability. Availability for private/individual appointments is Monday-Friday. *A 1-Hour minimum private/individual session for In-Home appointments or location of your choosing is available by appointment only. Please contact me to find a time to meet. It is best to book at least 1-3 days in advance. Bridal mehndi is priced as a flat rate rather than by-the-hour, as it is an intricate process, and exact timing to finish a specific piece can sometimes be difficult to estimate. It is best to meet 2-3 days before the date of the wedding ceremony as henna needs some time to oxidize and darken to its final color. If the wedding date falls on a Saturday, meeting on Wed or Thurs of that same week would be most ideal. 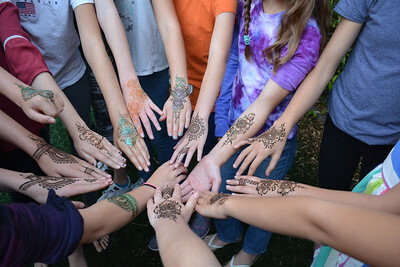 It is recommended that the bride have all hair/makeup/clothing in place before the henna is applied if additional festivities will be proceeding the henna session. This will increase the chances of the applied henna paste to stay on as long as possible. I highly recommend meeting at a quiet time prior to guests arriving as one must ideally stay quite still during the henna application. Multiple artists are also available if needed for larger wedding events.